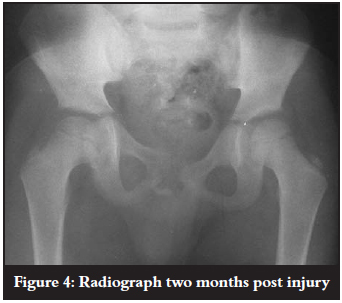 Two cases of acute traumatic dislocation of the hip joint are reported. This is a rare injury and the literature on this subject is limited to either case reports or combined multicentre studies. The aim is to report on two cases of acute dislocation of the hip joint treated by us and to review the literature on this injury. A 4-year-old boy was referred to our casualty department from a regional hospital with blunt trauma to the abdomen and a right hip dislocation following a pedestrian vehicle accident. The child was assessed and treated according to the Advanced Trauma Life Support protocol. Physical examination revealed an acute abdomen and a posterior dislocation of the right hip joint. The sciatic nerve was intact. The dislocation was confirmed by radiographs of the joint (Figure 1). The hip joint was reduced under sedation and analgesia (Figure 2) and treated by skin traction for three weeks. CT scan was done to confirm a concentric reduction and to exclude intra-articular fractures or fragments. 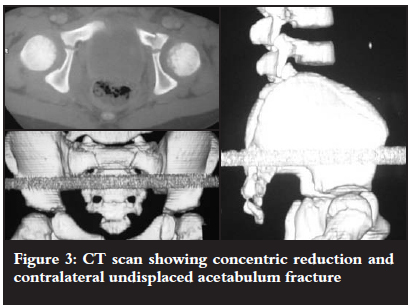 A contralateral undisplaced fracture of the acetabulum was discovered on CT scan and also treated with bed rest (Figure 3). The abdominal injury was managed surgically for a sealed perforation of the small bowel which required a relook laparotomy before full recovery. After three weeks in skin traction, the hip joint was painless and reasonably mobile. The patient was allowed to weight bear. The patient was seen at our clinic two months after discharge. He was mobilising without support but had a mild antalgic gait. On examination the hip flexed to 140º, abducted to 70º, internally rotated to 40º and externally rotated to 50º. Anteroposterior (AP) pelvic radiograph showed concentric reduction with no complications (Figure 4). An 11-year-old boy was brought to our casualty department by paramedics following a pedestrian vehicle accident. The child was assessed and treated according to the Advanced Trauma Life Support protocol. He had an isolated injury to his right hip and abrasions on the lower back. The hip was flexed, internally rotated and adducted. The sciatic nerve was intact. 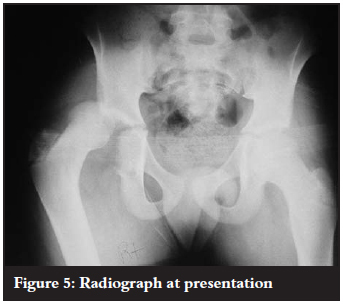 Radiographs confirmed a posterior dislocation of the right hip joint (Figure 5). The hip was reduced in theatre under general anaesthesia followed by skin traction for three weeks. 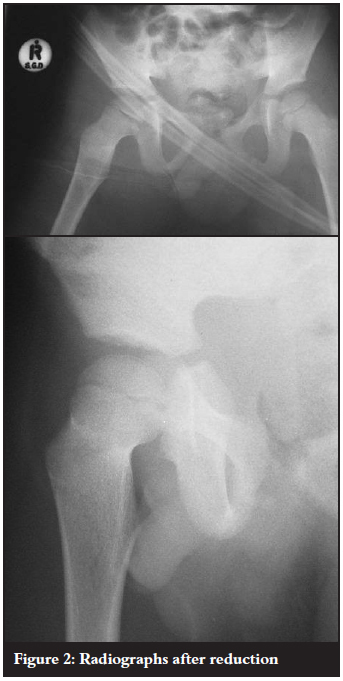 Post-reduction radiographs demonstrated a reduced hip and no other fractures (Figure 6). On discharge, physical examination revealed a painless full range of motion. He was discharged with a view to follow-up in our outpatient clinic but did not return for review. Our two patients fall into each of the described bimodal age group peaks and were both involved in road traffic accidents. Both of our cases were posterior dislocations, presenting with hip flexion, adduction and internal rotation. Complications related to traumatic hip dislocations can be classified into early or late. Sciatic nerve injury may result in up to 13% of cases following traumatic posterior hip dislocation. Femoral nerve palsy must be excluded in anterior dislocations.1 Associated fractures have been shown to result in a poorer outcome. A Japanese review on the topic found that fewer than 5% of hip dislocations were associated with a femur fracture.6 Separation of the epiphysis may also result in avascular necrosis (AVN). A French study reviewed five cases of hip dislocation with associated separation of the capital epiphysis. All of these cases resulted in AVN following open reduction and screw fixation.7 The incidence of overall AVN ranges from 3% to 10% and is related to the severity of trauma and time to reduction. 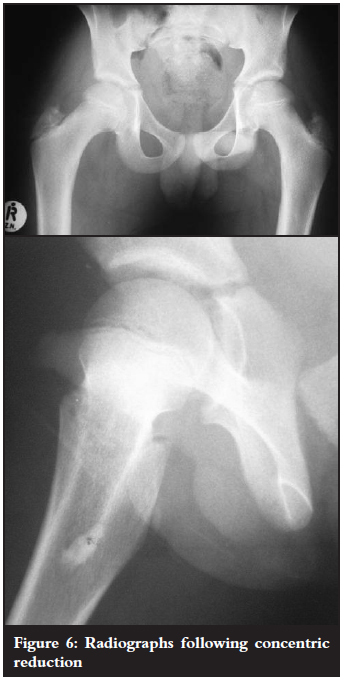 Chondrolysis is another potential but rare complication following hip dislocation.1 Degenerative joint disease is more prevalent if a concentric reduction is not achieved as shown by Glass et al.3 Soft tissue interposition with late arthrosis is a preventable problem, unlike many of the other complications, which are the result of the injury itself and out of the control of the treating surgeon. Our two cases emphasise the importance of early reduction and careful assessment with X-ray or CT scan after reduction to exclude fractures around the hip and to ensure a concentric reduction. Long-term follow-up is essential to exclude the complications described above. 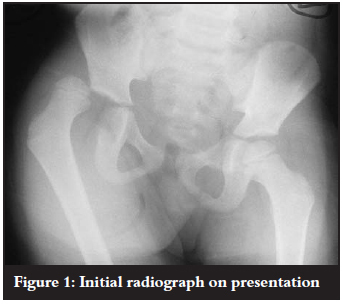 Traumatic hip dislocations in children are rare. Associated injuries must be ruled out. Urgent concentric reduction must be achieved for optimal results. Plain radiographs remain an important tool especially in the public hospital sector, but CT (or MRI) scanning is probably always indicated. A period of three weeks with skin traction following reduction is supported in the literature, although this is controversial and not always practical or necessary. Associated fractures of the acetabulum and femoral head must be excluded and treated appropriately. Long-term follow-up is required to exclude the development of AVN, degenerative joint disease and chondrolysis.